Hi folks I’m finally back. My goodness what an adventure! I will share my thoughts and escapades in France over the next couple of posts so I don’t bore you with my enthusiasm all in one go. My “Gone Fishing” post was hurriedly added on Thursday 28th April as a result of a phone call from our daughter in France – she had finally gone into labour and was in hospital. No more “false” alarms this was it! Mr. Piglet and I immediately went into “headless chicken” mode as we checked out flights on the internet and contemplated the quickest way to travel to France during a very busy holiday period. We abandoned all earlier plans of taking the plane and train and decided to drive the 2000 kilometres from Portugal, across Spain and into France. We quickly threw clothes into the suitcases, gathered together anything that we thought might be remotely useful (most of which was not), mobilized an army of friends to care for our garden and pool, made my “Gone Fishing” blog post and we were off! During the course of the afternoon, as we were racing across Spain, we received a text from our daughter to say baby Pigleta should be born in 30 minutes, the wonders of modern technology…but then no further communication for hours. What was happening? Was everything OK? How were Mummy Piglet (Piglet in France) and baby Pigleta faring…? We then received a text confirming Lily-May (Pigleta), our first granddaughter, was born at 16.13, measuring 49cms and weighing 3.540 kg. We felt elated! However, this elation turned to concern when we later learned all was not well with our daughter. 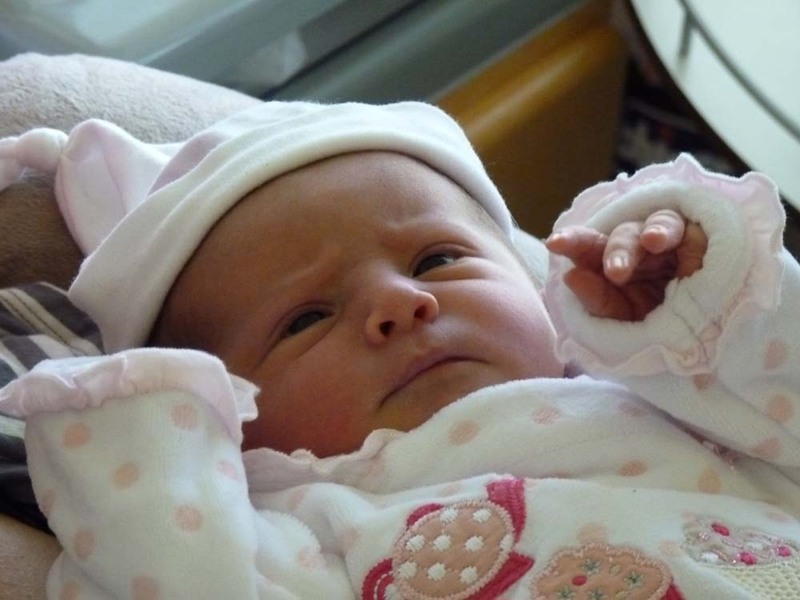 She had experienced problems during the birth and may have broken her coccyx. After 800km the journey was taking its toll so we made the decision to make a stop-over in Madrid and continue early the next morning. As we programmed our GPS system our thoughts were in turmoil, and with 1200km still to travel it would be touch-and-go as to whether we would make it to the hospital before visiting time ended. Oh what an unbelievably frustrating day – we not only encountered miles on miles of road works but then came the Friday evening traffic jams as we hit the French motorways. It was motoring hell! Reality then dawned on us, as three lanes of traffic ground to a complete standstill, that after all this effort we may not make it to the hospital to hug our daughter and meet Lily-May this evening, and yet another day would pass. Living in an area of Portugal where four cars represented a traffic jam we had completely forgotten the “stress” and “volume” of Friday afternoon traffic. Tears of frustration rolled down my cheeks as I saw miles of red tail-lights disappear over the horizon. To top it all our mobile phone then rang and a friend from Portugal informed us they had just experienced the worst electrical storm in a decade and our electricity had tripped. In our rush to depart yesterday morning none of our friends had our house key so they could reset the electric. Pooh! Pooh POOH!!! We were going to lose all the contents of our freezer and fridge, which were both stacked to capacity due to us taking advantage of a generous supermarket discount voucher, just last week. I don’t know if someone “above” at this point suddenly took pity on us but the traffic miraculously started to clear and we were on the move. As our speed increased a glimmer of hope was rekindled – we may just make it! We finally arrived at the hospital, physically and mentally exhausted from our journey, just an hour before visiting time ended. Our son-in-law fortunately came to meet us at the entrance of the maternity building to save us precious minutes in hunting for the correct ward. I almost fell into his arms with relief. As we walked in to our daughter’s room and was introduced to our granddaughter our hearts melted and the long, hot and frustrating journey was quickly forgotten. We were immediately smitten with Lily-May and I suddenly understood the joys of being a grandparent. Phew! A happy ending after all of that! Beautiful Lily-May (and photos) and so sorry about your daughter’s coccyx! Broke mine when younger, but besides sitting on a tuffet (pillow) for weeks, it healed. Hope hers will, soon! So, congratulations, grandma Piglet! Phew…was the word I was looking for! Congratulations Grandma!! Lily-May is beautiful! Hope mommy is doing better! Advice – pick her up, cuddle her, spoil her and when she crys just hand her back! That’s what being a grandparent is all about!!! It is a time for a special relationship with daughter and one I treasure. 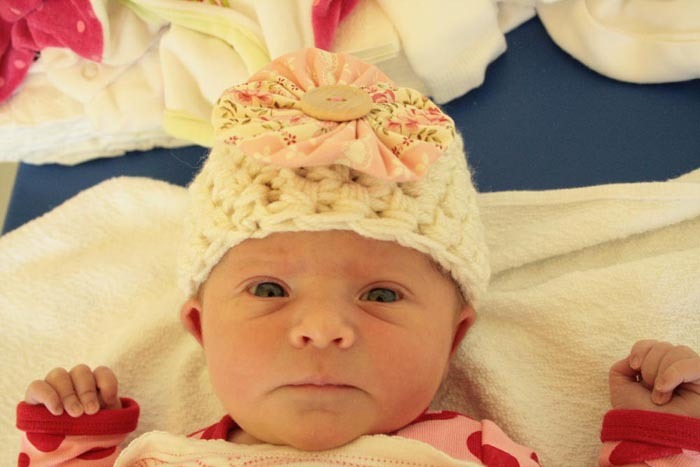 Congratulations on the arrival of Lily-May. She looks adorable. Wishing you much happiness. Hi mairedubhtx …thanks! She has certainly made us very happy. Can’t wait to go back to France to se her. Yep the moments with Lily-May were very special and can’t wait to go back and see her. Hopefully we will see her on the webcam. Mr. and Mrs. Piglet, Congratulations. Lily-May is just gorgeous. How exciting. Your post brought tears to my eyes. As always, your writing is wonderful and the story was gripping. I’m so glad you made it that evening. What happened at home with the electrical outage? Thank you as always for your kind words. I have to say I felt very stressed sitting in the Traffic jam…but someone up above must have taken pity on us. Will be round to everyones blog soon to catch up! My goodness what a stressful trip you had. I’m so thankful it all worked out finally and you to be with your precious sweet granddaughter. It was stressful but even the the journey was arduous I am so glad we drove there as it gave us flexibility. Lily-May is absolutely adorable and can’t wait to go back and see her. she is absolutely gorgeous! congrats to your family…enjoy every second of it! Yep..can’t wait to go back to France. She is 2 weeks old 2day! Woop! Congratulations! She looks lovely! Sounds like you had quite an adventure! Look forward to reading all about it! Nice to see you back again! Hi Noob…nice to be back and will be catching up with everyone over the weekend. Oh congratulations – she is so beautiful. Auch, poor guy! Didn’t they have an extra bed for him? Congratulations! I hope mummy is ok too? Pigletta is so cute! Congratulations to the whole Piglet family! Lily-May is so beautiful. I’m looking forward to hearing about the whole visit and all the love & cuddles you gave her. it certainly was harried….but seeing our daughter and soninlaw with Lily-May I would have travelled to the moon! I bet not as much as we are missing you! Loved your post BTW. May she bring you great happiness. Spoil her…it is your right! He He Grannyville – I love it! Congratulations Pip! Oh the wonderful world of grandparenthood! She’s a real sweetie and already has a face full of personality–oh the fun you will have! We just got our first grandchild last October. Congratulations. Enjoy the moments. As a long-distance grandparent myself, I try to make all the precious moments count. And if you don’t have it already, get Skype. It’s a life-saver for when your heart is breaking because you never get to see your granddaughter. Congrats on your first GC as well! My heart is breaking already. I would just like to give our daughter a BIG hug right now. She had a difficult birth, many problems and is still bedbound. What a wonderful story PiP, I was on the edge of my chair reading this! The hoops you and your husband jumped through to get to see your delightful grand-daughter, but hey – you got there in the end and like you said, how quickly you forgot everything once you saw her! I remember my (ex) mother-in law saying to me about labour that they are the worst pains but the soonest forgotten. She was so right! I wish you and your newly extended family all the very best, hope your daughter is recovering – I got chicken pox the day after I gave birth to my second son and I’ve some lovely (not) photos to prove it as I was rushed into isolation! Wow you were so unlucky to get chicken pox! Not the best start after giving birth. Glad to have you back! 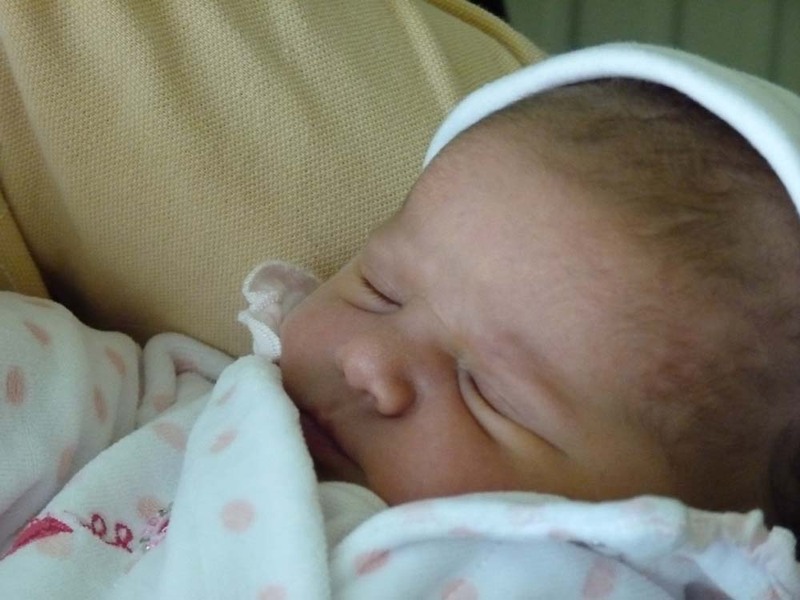 Congratulations on the safe arrival of Miss Pileta! Especially, of course, to the parents, without whom none of this would have been possible! How was the freezer when you got back? I assume you’ll tie up the loose ends in future posts! Like Mum’s coccyx. That is a decent sized baby! Good to be back but I’m missing them all terrribly. It must have been awful for you when you were separated from you family. It just aches. Still separated. 😦 It is our wedding anniversary this coming Sunday. That is going to be hard. Hopefully they will come home around my birthday. Congratulations! Lily-May a beautiful name for a gorgeous little girl. I hope that both mum and baby are well now. Baby pictures always brighten up the day!! What wonderful newa. Congratulation to you all. Lily May looks adorable. I look forward to seeing many more photos of her. Can’t wait to go back and see her!